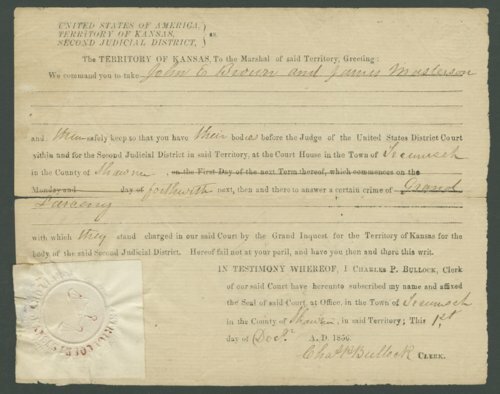 These legal documents relate to the case of the Kansas Territory vs. John E. Brown, John Broils, and James Masterson for grand larceny. Brown, Broils, and Masterson were accused of stealing cattle from James Dudley, Henry Dudley, Rubin Grace, and Margaret Keith on September 21, 1856. The defendants were indicted during the November term of 1856 by the U. S. District Court of the Kansas Territory, Second District.